Sunday: Mix of sun and clouds, Cape flurry. Highs in the 40s. Sunday Night: Mostly clear. Lows in the 20s. Monday: Lots of sun, late clouds. Highs in the 40s. After a few early morning snow showers on Nantucket, a departing ocean storm will allow more sunshine to develop during the afternoon on Sunday. Highs will still be running cooler than average, only reaching the 40s in most towns. It turns cold again tonight under mostly clear skies, with lows in the teens and 20s for many. Monday will keep the below average trend going, with more 40s during the afternoon. Sunshine will be widespread, aside from a few clouds coming in late day. Those clouds run out ahead of a weak disturbance that comes into New England on Tuesday with light rain and snow showers. Behind that sun returns on Wednesday and highs finally get close to 50 degrees, which is average for this time of year. Yet another batch of rain showers arrives Thursday, but because the center of low pressure triggering those showers moves north of us, we can enter into the warm sector. Highs will surge into the 50s. We’ll stay in the 50s into next weekend as it looks now. There are growing signs that moderate to heavy rain will move through the area at some point on Sunday, or potentially on Monday. 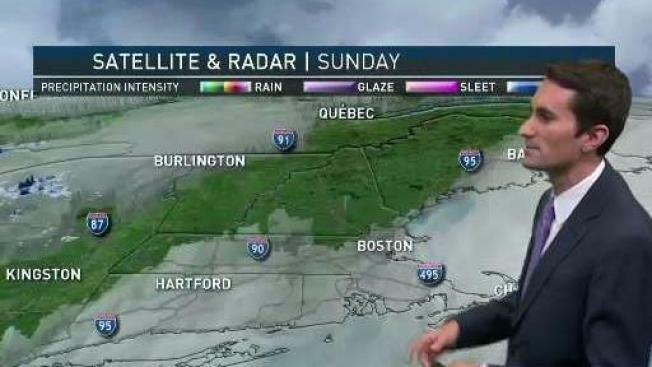 It’s too early to know for sure if it will impact the Boston Marathon, or if the rain will exit in time, so we’ll watch the forecast carefully in coming days.